Enabling Jumbo Frame support in Hyper-V Server 2008 R2 (or Windows Server Core) has proven to be a bit of an adventure. It really just involves setting the MTU size, but it has to be done in the OS (to affect the TCP/IP stack) as well as the network cards’ driver. Since Core versions of Windows do not have a network control, setting the MTU on the cards proves to be a bit of a trick. This is what I had to do to enable Jumbo Frames on several iSCSI nics, and since it differs for Intel vs Broadcom adapters, there are two procedures. I should point out that this does not address configuring the network switch that these nics are attached to. That is a whole ‘nother can of worms, but suffice it to say that the switch must not only support Jumbo Frames but have that support enabled, along with a whole host of other settings. The first thing you need to do is make sure that your server will allow jumbo frames. You do this by setting the MTU on your adapters to 9000. The easiest way to do this is by running a netsh command on each adapter you want to use Jumbo Frames. In this case I have already re-named the Interfaces that I intend to use for iSCSI. You might just see a whole list of “Local Area Connection” interfaces. You can use ipconfig or netsh to further identify which ones you want to use. Now you have to configure Jumbo Frames in the driver for each interface. Here you will see all the network interfaces listed by GUID. I have found that the easiest way to determine which GUID is which adapter is by finding the IP address and being able to correlate it to the right Interface name. Scroll up to find the “*JumboPacket” key and double click it to change the default value of 1514 to 9014. Note the extra 14 bytes here represents packet headers that normally are not counted in MTU size. Repeat this for each Intel adapter you need to configure, and then reboot the server for the setting to take effect. First make sure you have the latest Broadcom drivers. Make sure you get the 2008 R2 x64 set. If you haven’t already, then download and install the driver and then reboot the host. Note: Make sure you migrate any existing guest servers off the host before you install the drivers. The temporary outage of the card due to the update seems to make a failover cluster angry. 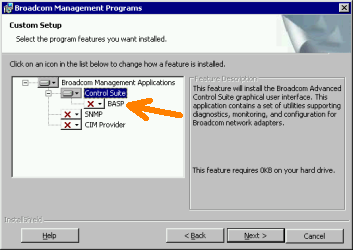 Now get the Broadcom Management Application suite. Again, get the x64 set from the same page. Install the management app. I opt’d not to install the BASP component (see screenshot below) since we do not want failover or teaming in this scenario. It’ll likely warn you that you need the dotNet Framework 2.0 and you should be able to ignore this because the installer just does not recognize the “Core” framework, but the application still runs. To make sure you do in fact have the framework installed, run “oclist | findstr /i netfx” and look for a line stating that NetFx is installed. For example, “Installed:NetFx2-ServerCore”. If not, you can install it by running “start /w ocsetup NetFx2-ServerCore” or instead you can install dotNet 3.0 and 3.5 by running “start /w ocsetup NetFx3-ServerCore”. If you did the Intel configuration you’ll notice the four digit number in square braces of the Name field matches the ControlClass registry key. Use some combination of “ipconfig /all” in another window or CtxAdmTools’ Visual Core Configurator 2008 or the four digit registry code to identify the adapter that you want to configure. In this example we want Connection #6. Select it by using “select 6” or whatever number is in the “C” column that matches your adapter. Now validate that you have selected the correct adapter by reviewing some of its details. Run “info” to see it’s MAC/IP, etc. Notice the MTU setting is set to 1500 by default. Now run “cfg advanced” to list its advanced properties. Run “cfg advanced “Jumbo MTU”=9000” to set Jumbo frames to 9000 bytes. Note that you do not have to account for the 14 bytes of header data here. It’ll take a few seconds to apply the change but you should not need to reboot (yay!). You can now run “cfg advanced” and “info” to list the settings and ensure that the MTU is in fact set to 9000. You should also enable Flow Control for Transmit (Tx) and Receive (Rx). With the correct adapter already selected, run “cfg advanced “Flow Control”=”Rx & Tx enabled””. Once that is complete you can enter “q” to exit BACScli or start over using “list ndis” and select another interface to configure. You can also use this utility to select non-Broadcom adapters to display some of their info like MTU size. To test if Jumbo Frames are working you can ping another host target that also supports Jumbo Frames. The easiest way that I have found to do this was to just change the IP of your test NIC and your test target NIC to something that no other adapter has. This is because there is no way to tell windows specifically what NIC to send traffic over, so setting the NIC’s to their own network ip space is the only way to ensure that the ping traverses a particular adapter. For example, I changed the source test nic to 172.16.1.4 and the target to 172.16.1.8 and no other adapters on either host saw set in the 172.16.1. * range. First try a normal “ping 172.16.1.8” and it should work fine. Then use “ping -f -l 6000 172.16.1.8” to test jumbo frames and it should also work, only this time you’ll see it sending 6000 bytes instead of 32. So that about covers it. I had to do this for each of the 32 iSCSI nics spread across the 8 host servers, but it works! You should be aware that if you do a driver update or if you share a NIC with a virtual network (as a Hyper-V Host) your settings may be lost and you’ll have to go through this again. Ejecuta “regedit” y busca el registro HKEY_LOCAL_MACHINE\SYSTEM\CurrentControlSet\Services\Tcpip6\Parameters ,en la carpeta Parameters creamos una nueva clave de tipo Valor de DWORD de 32 bits, en el panel derecho, click derecho y selecciona New – DWORD, poner como nombre de atributo “DisabledComponents”, luego hacemos click derecho del ratón, modificar y le asignamos el valor “FF”; una vez realizado, reinicia el equipo para que los cambios se hagan efectivos. Si mas adelante requieres habilitarlo tan solo borra la entrada añadida en el registro y reinicia el equipo. Esto básicamente nos sirve porque la mayoría de nosotros utilizamos tráfico de red IPv4 y el IPv6 lo tenemos activo pero sin ninguna utilidad, también se deshabilita porque a veces suele ocurrir que tenemos es tráfico de la red a través de un Firewall que monitoriza sólo el tráfico que pasa a través del IPv4 dejándo un gran agujero de seguridad en el protocolo IPv6. When conducting network troubleshooting exercises on a daily basis, you start to take some of your simpler and more common tools for granted, until you lose them that is. One of these basic tools for troubleshooting network connectivity issues is the ability to manipulate the advanced parameters on your network card. I ran into this issue while trying to hard code the Speed and Duplex settings of a card in a Windows Server 2008 Server Core machine. This Advanced tab contains all of the Parameters that the NIC manufacturer has available for that card via the drivers associated with it. Now this is all well and good as long as you have a GUI. But, when that interface is removed as is the case with Server Core, you are left wondering, “What now?” To date I have not seen any command line tools created by the network card vendors to take the place of the GUI tools that no longer exist in Server Core. Once you have found the adapter of interest in the registry, drill down to the NDIParams key. Once there, all of the parameters available on the card should be listed. You can see from Figure-3 that I chose the SpeedDuplex setting and under the Enum portion you can see the list of possible settings to choose from. Therefore, if I want to set my NIC to 100Mb/Full duplex I need to use a value of 4. It is very important to examine each parameter and determine what value you must use to get the expected result. Each vendor seems to use their own system choosing a value. Now, in my case I wanted to set the SpeedDuplex setting. This method should also be useful for turning off other features on the NIC such as “Large Send Offload” and “Jumbo Frames”. I hope this article helps someone with their Windows Server 2008 Server Core configurations, but before you use this please consider all of the usual disclaimers about editing the registry and how badly it can screw up your day if you get things wrong. AntiSpam/Antivirus Filtrado Correo – SonicWall (sólo clientes). Correo Electrónico OWA (sólo clientes). HAProxy – Instalación, configuración, actualización….. Copyright © 2019 Roberto Martínez Martín. All rights reserved. Este sitio web utiliza cookies cookies propias y de terceros partes para mejorar la experiencia de usuario. Si continua navegando, consideramos que acepta su uso. Puede obtener más información en nuestra Política de cookies.